Flight tracking websites and apps utilize a complex network of real-time data to deliver flight information for multiple airlines on a global scale. Not only can you track flights in progress on a map, you can check on airport delays, weather, private charter flights, and much more. Flight tracking services have interactive maps with real-time data for multiple airlines and private flights all over the world. For travelers flying with multiple airlines, a flight tracking service provides all the information on one site. The homepage at FlightAware has a search box similar to what you find on an airline's website with the same search options for flight numbers or cities (airports). A city-to-city search brings up a long list of airlines and flights with the status posted on the same page, so you can quickly determine whether a flight has arrived, is en route, is on time or delayed. You'll also find out the scheduled time of future flights that day. 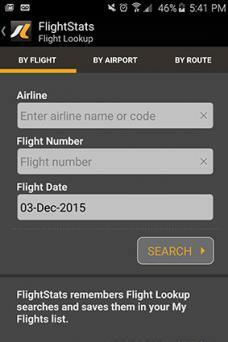 A free FlightAware app is available for iOS, Android, Windows phone and Windows 8 devices. FlightView's flight tracker search box is located in the upper left-hand corner of the homepage. Directly underneath it, you will see a map of the United States which highlights major airports around the country with dots to indicate flight statuses. Green dots indicate normal activity. Red dots indicate major delays. Enter a city-to-city search to bring up a list of flights for the day. 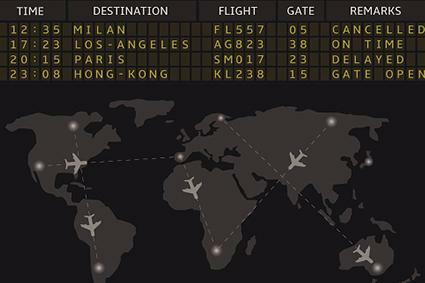 Click the link in the status box of a flight to view detailed information and a map showing the plane's route. Click on another link near the arrival information to open up a new window and continue tracking the flight live. You can create an account with FlightView and forward your flight itinerary confirmation e-mails to trips@flightview.com. The information is automatically added to your My Trips account and provides quick access to flight statuses which you can share with friends, family and colleagues. You can also sync your My Trips account to the free FlightView mobile app for iOS and Android devices and receive alerts whenever changes occur to your flight status. Real-time flight status information is provided via FlightView, which is included as part of United's app, and you can access this info by entering a flight number or the departure and arrival cities and the current date. You can also check info for the previous day or up to two days ahead. By entering the flight number, you can get real-time status on a flight in progress or the actual arrival and departure times of completed flights. If the plane is late leaving the gate, you'll see this information until the plane is in the air. A flight in progress says "in flight," and a map of the actual route is provided. You can continue to get updates by clicking an update button, which provides an estimated arrival time as the flight progresses. FlightStats has a small search box on the right-hand side of the homepage which provides the option to search by flight number, by airport, or by the route. When viewing a list of flights from a city-to-city search, you can click anywhere along the single line showing the flight number and carrier to view detailed information about the flight. An overview box appears showing the scheduled and actual departure and arrival times and gate information. An event timeline - This is a chart which documents all changes made to the flight. A position log - This is a chart of the last 200 positions of the plane which shows the time, speed, altitude, longitude and latitude. On-time performance - This shows percentages of on time departures and arrivals for each airport and an overall rating for the on-time performance of the flight. FlightStats offers other information such as performance reports for airlines and airports, global cancellations and delays, and current weather conditions at airports. 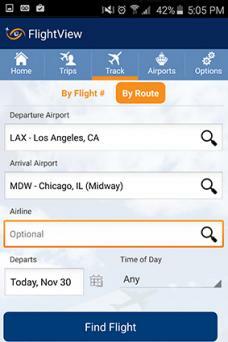 A free app is available for iOS and Android devices, and FlightStats has a mobile website. FlightView and FlightAware show up frequently on recommendation lists. Conde Nast Traveler mentions both in its top 10 list of apps that will make your trip less stressful. In an article published at Macworld, senior contributor Rob Griffiths recommends FlightView for frequent flyers with iPhones or iPads because the app can support multiple itineraries, has information on airports and weather, and lets you add future flights easily. Alexander Maxham, section editor for Android Headlines names FlightAware as his favorite flight tracker app, noting that he finds it more up to date than airlines apps. 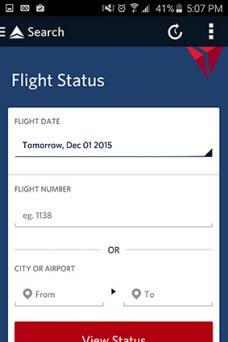 Delta Airlines offers flight status information via the Fly Delta app for iOS, Android and Windows phones. Once your flight reaches 10,000 feet, you can connect to WiFi and use the flight tracker to see exactly where your plane is. Delta also has a flight status search box built into their website's homepage. 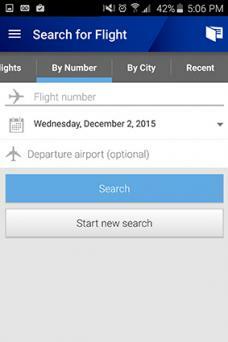 Choose the option to search by departure and arrival city or by flight number. Then select either yesterday, today or tomorrow. A search from city-to-city displays a list of all the scheduled flights that day, including the type of equipment or aircraft being used. Click on the flight number to get the actual flight times and gate information. Ultimately, choosing which real-time flight tracking system to use boils down to personal preference. 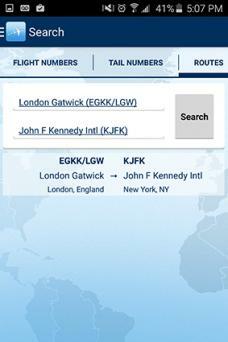 If you fly with just one airline, give the airline app a try to see how it performs with your device. If you frequently fly on multiple airlines or have a general interest in aviation, you should definitely browse through a flight tracking website or install an app on your tablet or smart phone. Tracking the flight of a loved one in real time can provide peace of mind and help you arrive at the airport at the right time.